Angiography use has become increasingly common worldwide. 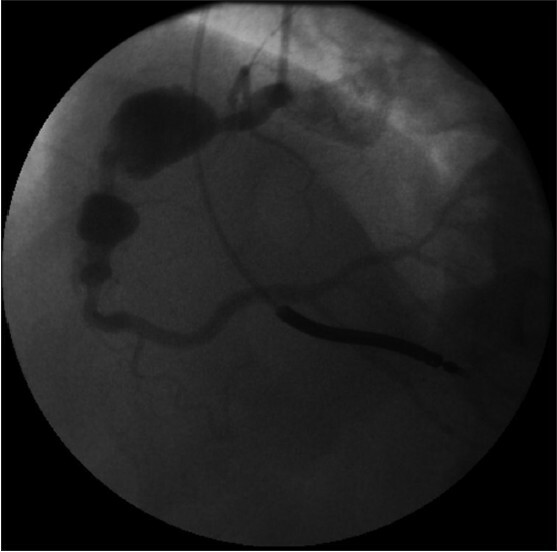 Coronary artery aneurysm may be an incidental finding during angiography. Occasionally it might be symptomatic or may become symptomatic over the course of time. Rupture of aneurysm may lead to disastrous complications. Here we present a case in which aneurysm was asymptomatic but surgical intervention was done because of rapid increase in the size of aneurysm. This is to drive home the point that timely surgical intervention is instrumental in preventing complications associated with possible rupture of the aneurysm. Majority of patients with CAA are asymptomatic from any of the clinical effect of the aneurysm which is detected during angiography while investigating for some other pathology. Giant aneurysms, however, may become symptomatic; size and location determine their manifestation. CAA's can present with myocardial ischemia due to thrombosis secondary to sluggish blood flow in the aneurysm. A 52-year-old man presented with a history of hypertension and coronary artery disease (CAD). The patient previously had stents placed in Left anterior descending (LAD) artery in 2001 and in the Right Coronary Artery in 2004. An implantable cardioverter-defibrillator (ICD) was placed two years back for an episode of ventricular tachycardia. Left ventricular systolic dysfunction with an EF of 24% was demonstrated at that time. Patient developed exertional chest pain and a cardiac catheterization was scheduled. Angiography revealed an 80%-90% in-stent restenosis in left anterior descending (LAD) and a patent stent in the distal RCA. 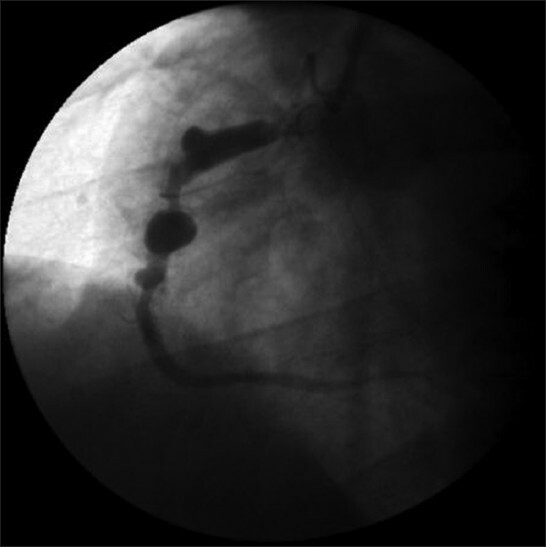 There was a 2.2 cm by 3.2 cm aneurysm in the proximal RCA and another measuring 1.4 cm by 1.5 cm in the mid RCA [Figure 1]. Ventriculography demonstrated antero-apical hypokinesia. A cardiac catheterization two years earlier had demonstrated an aneurysm of 1.2 by 2.5 cm in proximal RCA and 1.2 cm by 1.2 cm in mid RCA [Figure 2] and [Figure 3]. At that time he was started on Coumadin due to CAA and left ventricular dysfunction. Although, patient appeared asymptomatic from the RCA aneurysm, he required revascularization of the LAD territory. Given the rapidly increasing size of aneurysm, he was referred for surgical intervention. After median sternotomy and the institution of cardiopulmonary bypass with cardioplegic arrest, the aneurysms were inspected and found to be impinging on the right atrium but not communicating with any cardiac chamber. The RCA was ligated proximal and distal to the aneurysms and a free radial artery graft was placed to the posterior descending branch of the RCA. In addition, the left internal mammary artery was grafted to the left anterior descending coronary artery. The patient's post-operative course was complicated by atrial fibrillation with a rapid ventricular rate followed by ventricular tachycardia about six hours post-operatively. Normal sinus rhythm was regained after electrical counter shock and he was placed on an amiodarone infusion for 24 h. An intra-aortic balloon pump was placed at that time. The apparent trigger for ventricular tachycardia was myocardial ischemia secondary to atrial fibrillation with rapid ventricular response. Right ventricular ischemia due to sacrifice of right ventricular branch by ligation of the RCA aneurysm was considered. However, electrocardiograms done before and immediately post-cardioversion did not show any ischemic changes. Electrolytes were normal at the time of ventricular tachycardia. Transesophageal echocardiogram done shortly after the event showed an EF of 20% with akinesia of the inferior wall and hypokinesia of posterior, lateral and septal walls, essentially unchanged from preoperatively. Increased recognition of CAA's parallels the widespread use of coronary angiography. Atherosclerosis is the most common cause of CAA. Other causes include Kawasaki disease, congenital, mycotic, post syphilitic, connective tissue disorders or pseudo aneurysm secondary to vessel injury following percutaneous intervention. ,,,,, Recently there have been reports of CAA formation following placement of a drug eluting stent. In the current case, there was a stent placed in RCA about nine years earlier but the CAA developed in a non-stented area. Thus, its cause is most likely secondary to atherosclerosis. 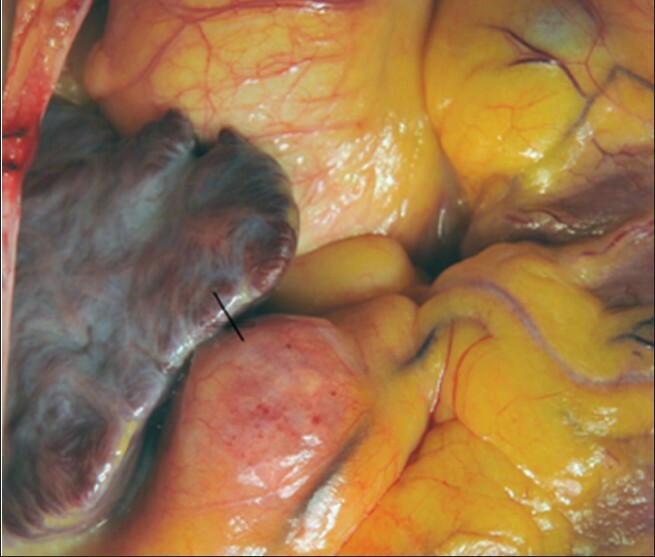 The aneurysm was not resected and therefore not subjected to pathologic examination. Our case was interesting and unique because of the documented rapid enlargement of the aneurysm over two years. Despite the giant CAA, the patient remained asymptomatic from the aneurysm. He was successfully treated surgically despite an episode of post-operative ventricular tachycardia. He subsequently did well and has returned to normal activities. With increasing recognition of such cases, it becomes mandatory to adopt and formulate universal approaches for their management and surgical resection is the definite answer to such scenarios. Otherwise, catastrophic complications are always possible for any delayed therapeutic decision. 1. Pepino P, Oliviero P, Di Tommaso L, Stassano P. Rapidly expanding right coronary artery aneurysm. J Thorac Cardiovasc Surg 2006;131:1396-7. 2. Telli A, Yagdi T, Cikirikcioglu M, Tekdogan M. Right coronary artery aneurysm. Asian Cardiovasc Thorac Annals 2002;8:256-7. 3. Bruhin R, Stock UA, Breuer M, Wahlers Th. Successful in situ repair of a symptomatic left main coronary artery aneurysm by a saphenous vein graft. Interact Cardiovasc Thorac Surg 2004;3:434-6. 4. Everett JE, Burkhart HM. Coronary artery aneurysm. J Cardiothorac Surg 2008;3:1. 5. Jha NK, Ouda HZ, Khan JA, Eising GP, Augustin N. Giant right coronary artery aneurysm. J Cardiothorac Surg 2009;4:18. 6. Holinski S, Dohmen PM, Lembcke A, Konertz W. Surgical management of multiple coronary artery aneurysm, including giant form. Tex Heart Inst 2009;36:238-40. 7. Pahlavan PS, Niroomand F. Coronary artery aneurysm. Clin Cardiol 2006;29:439-43. 8. Vinchurkar N, Chopda M. Right coronary artery aneurysm. Indian J Radiol Imaging 2007;17:54-6. 9. Firstenberg MS, Azoury F, Lytle BW, Thomas JD. Interposition vein graft for giant coronary artery aneurysm repair. Ann Thorac Surg 2000;70:139-8. 10. Almutairi M, Almerri K. Symtomatic large coronary artery aneurysm associated with Sirolimus-Eluting stent placement. Kuwait Med J 2007;39:190-2. 11. Westaby S, Vaccari G, Katsumata T. Direct repair of giant right coronary aneurysm. Ann Thorac Surg 1999;68:1401-3. 12. Komoda S, Komoda T, Ivanitskaia-Kuehn E, Dreysse S, Pasic M, Hetzer R. Giant Aneurysm of the right coronary artery and fistula to the coronary sinus. General Thorac Cardiovasc Surg 2010;5892:78-81.